So I went to California for a convention, but also a mini vacation, but ALSO for the food (not ashamed to admit this), and I was NOT disappointed. The only thing I was disappointed about was having to leave and not being able to eat more of it. So if you have an upcoming trip to California, this is your guide! And if you don’t, get yourself a plane ticket and pay attention. 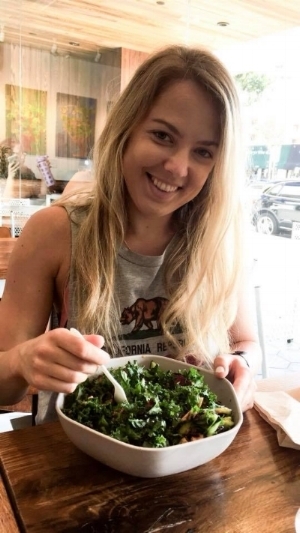 Being gluten and dairy-free was not a problem navigating Los Angeles, which was basically paradise for gluten-free and vegan connoisseurs. Where my ice cream lovers at?! 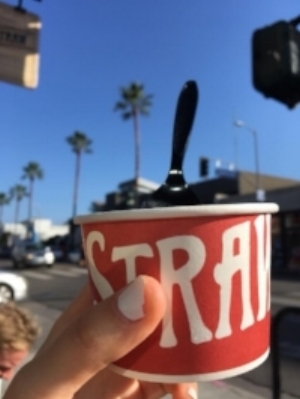 Salt & Straw carries dairy and vegan flavors. The vegan flavours are constantly rotating but, I kid you not, this was the creamiest ice cream and the closest thing I’ve ever tried to dairy ice cream. So. Damn. Good. Don’t skip this one! Okay so the menu was over whelming but in a GOOD way! Butcher’s Daughter has multiple menus depending on the time of day: Morning - Afternoon - Evening - Brunch (weekends) - Dessert & Wine. Not only is their food fresh, tasty, and original, their decor makes you never want to leave. They also have an indoor seating area and a cute patio area that overlooks Abbott Kinney. You may need to make multiple trips…. just sayin’. Featured: Avocado Toast with Poached Eggs & Buckwheat Pancakes with Turmeric Latte & Lemonade. 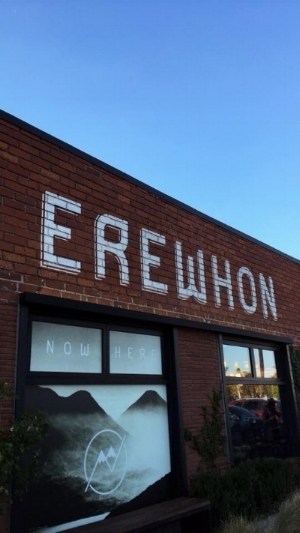 I had been dreaming of the moment I would set foot into Ehrewon Market for years. Not even joking. It’s basically the Disneyland of grocery stores. Okay you may be paying extra but their hot bar is hella sophisticated. They also have all the healthy snacks, yogurt, ice cream, chips, etc that we canadians cannot get our hands on. Even if you don’t end up buying anything (good luck) it’s worth the stop! Think a better version of Whole Foods. This was a great pit stop after a hike to the Hollywood Sign! Basically, you pick a bowl or salad or make it yourself with all the greens, add ons, and toppings your heart desires.. Plus they mix everything together before they serve you. I don’t know why this was such a pleasant surprise but it makes a difference when you don’t have to chop and mix your salad for 10 minutes before you eat it. Anyone else have this struggle? You can find Sweet Green all across the States. Great healthy “fast food” option! This was another one that I kept drooling over on Instagram. Dreams do come true. Frozen yogurt used to be my favourite thing ever until I realized dairy wasn’t for me. Thank goodness someone thought of vegan frozen yogurt! At Pressed Juicery, you choose your base yogurt then add toppings like nuts, chocolate chips, fruit, coconut, etc. Heaven on earth. Every time I go to the States I HAVE to stop at a Trader Joe’s. They have the coolest items you can’t really find anywhere else. Whether you need ready made salads, dips, sauces, cereal, granola, nut butters, or even cleaner body products, TJ has it all! I always stock up on veggies, salads, and breakfast items so I can make my own meals when I am staying at a hotel or Air Bnb. Superfood galor ! From drink powders and snacks, to beauty products, everything is infused with powerful nutritional boosters. And they’re all so beautiful. I was blown away to see serums and lotions containing medicinal mushrooms and adaptogens…. This is the future, people. Check it out. Similar to Sweet Greens, this was a life saver when I needed to find a quick healthy lunch! Staff are super accommodating to your needs and any modifications. You can build you own plate by choosing greens - protein - side options, or choose from the selection of salads, bowls, soups, and sandwiches. There is definitely something for everyone! I could have stayed here forever, surrounded by the finest superfoods on the planet. 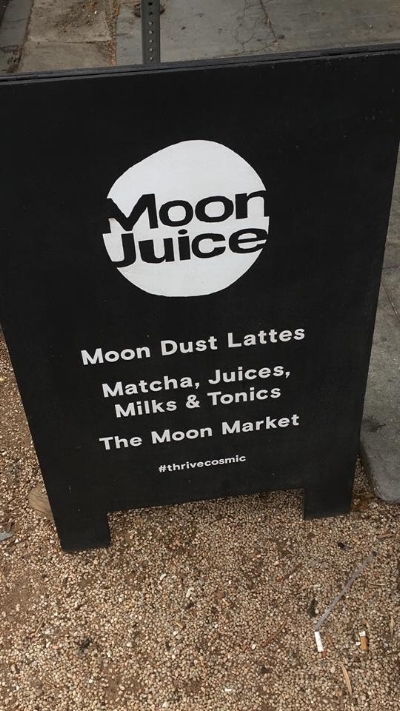 They had the most original juice blends I have ever seen as well as tonic shots, nut milks, smoothies, syringe shots (crazy right?? ), as well as salads, soups, wraps, tapas, and snacks! If you’re into nutrition and health at all, you need to stop here. This was probably number 1 on my list of places to eat at. How many times had I heard it mentioned beforehand I can’t even count. And I basically knew the menu by heart before I got there. The menu is super creative, to say the least. Everything is plant-based, sustainably and locally sourced, and BEAUTIFUL. Whether you’re craving a fresh salad, acai bowl, or pasta that hits the spot, they have it! My first stop in California; Organic Mexican food. Need I say more. The bowls are super filling and flavourful. Whether you are veggie or a meat eater this is place is a must (if you like Mexican food that is). They also have some great drinks like iced teas, coconut waters, lattes, and juice. They seem to be all over the place which is practical when you need something quick to go! This was probably my favourite spot. The food was insanely delicious and their location is completely my vibe. Though it is off the beaten path (you better have a car) its beachy laid-back surfer town vibes are welcoming and will make you never want to leave. You are basically transported across timezones to an Australian surfer town. Which makes sense as its run by a bunch of Australian foodies who know their stuff. These guys focus on locally sourced ingredients and boast gluten free and vegan/vegetarian options. They have a cute little indoor shop but I would recommend sitting outside at their adorable alleyway seating.